STAR TRACE Magnetic Roll Separators are roll type dry magnetic separators with fixed magnet having high field intensity and gradient. The magnets used in the Roll Magnetic Separators and made of alloys of rare earth elements are more powerful as compared to other magnets. The Magnetic Roll Separator generates high attraction forces on the magnetic roll due to their properties and special magnetic series. The obtained high magnetic attraction forces have low magnetic sensitivity and therefore they make it possible to separate very fine low magnetic minerals with a high recovery rate in the Magnetic Roll Separator. The most distinguishing property of Roll Magnetic Separators are that they are an alloy of rare earth elements produced domestically and more powerful. The Magnetic Roll Separator Systems have a number of standard sizes in which the high gradient separators are produced, and all of these sizes only require a low installation height. It is also possible to make Magnetic Roll Separator in accordance with customer specifications. Depending on the requirements made and the application, a choice can be made for a single stage Magnetic Roll Separator or for multiple stage Magnetic Roll Separator stacked one brlow the other. This results in an even higher degree of iron separation. Roll Magnetic Separators consist of two rolls, one of which is magnetic while the other is not. There is a belt between them to carry the ore into the magnetic field. The movement of the belt is controlled by a motor fixed to one of the rolls. The rotational speed of rolls in the Magnetic Roll Separator can be adjusted according to the material properties. The material to be processed is conveyed to the Magnetic Roll Separator belt by vibrating feeder at a required rate. Feeding rate can be controlled by adjusting the vibration on feeder. A separators blade has been set at the discharge location of the Magnetic Roll Separator in order to be able to collect separated products in different places and to adjust the product properties in a desired manner. Standard 2.5, 2, 1.5, 1, 0.75, 0.5 and 0.25 meter wide magnetic roll separators. Also available in a laboratory scale model with readily interchangeable rolls of 100 mm length. 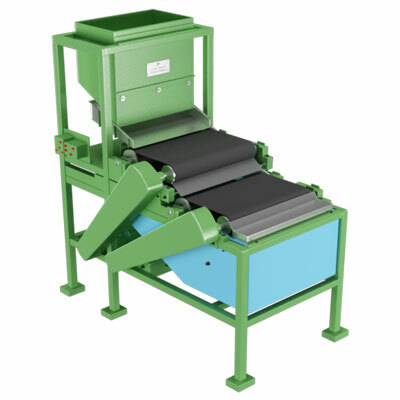 The Magnetic Roll Separator is supplied with a vibrating feeder to suit the roll width. Magnetic roll feed rate typically 2.5tph. The magnetic roll incorporated in our Magnetic Roll Separator has been specially designed and developed to generate exceptionally high magnetic field and gradient. The rolls which are built using rare earth Nd-Fe-B are manufactured to very low dimensional tolerances. The magnetic rolls incorporated in our machines have been specially designed and developed to generate exceptionally high magnetic field and gradient. The rolls which are built using rare earth Nd-Fe-B is manufactured to very low dimensional tolerances. Recovery of Metals from Slag. Ultra High Purity Quartz Cleaning. Induced Magnetic Roll Separators are primarily used for separating or concentrating minerals or materials of low magnetic susceptibility. Uses of Magnetic Roll Separator includes extraction of iron or chromium bearing minerals from silica sand, the concentration minerals such as wolframite, the removal of paramagnetic minerals such as Iron Titanium Oxide (Ilmenite, FeTiO3), Iron Carbonate (siderite, FeCO3), etc., from valuable non-magnetic minerals, and purification of dry granular chemical compounds and abrasives.These self-cleaning magnetic roll separators selectively removes magnetic components out of a conveyed material and discharges them as distinct and clean material. Field intensity is adjustable for selective recovery. Very high gauss of 20,000 is achieved by the magnetic separators. The particle size - for most materials the maximum size which can be satisfactorily treated is 3mm. For the treatment of dry materials up to 50 mm in size, electromagnetic multi-channel Pulley or Drum Separators are available (details available upon request). The presence of fine particles (particularly those less than 30 microns) reduces throughput. The flow characteristics - these are determined by particle shape, surface condition and moisture content. Better flow characteristics increase throughput.